There's hardly a week goes by where China is not in the news. And this last week was no exception as China's President Xi Jinping set off for the US. Meanwhile the artist Ai Weiwei, a thorn in China's side when it comes to human rights, arrived in Britain at the opening of a retrospective exhibition at the Royal Academy. Both individuals have attracted a large amount of media attention in the Western press, though you'd have been hard pressed to find any comment in China's media concerning the controversial artist. Even before Xi was expected to arrive in Seattle for the start of a week long visit, US media was publishing in depth analysis concerning Sino-US relations. Issues concerning China's expansion in the South China Sea, the recent display of military might during the WWII commemorations in Beijing, and concerns over state sponsored cyber attacks were the focus of many articles. While the US does much trade with China, and wishes to maintain a good business relationship, hacking and military concerns are rarely off the table [CNN] . For any such cooperation, China would have have to concede it was behind such attacks. However, China continually maintains that it is not involved in any state sponsored hacking or cyberattacks on America. Indeed it tends to fall back on the old rhetoric that China itself is a victim of such attacks, though it rarely releases any detail concerning such attacks. The very same day in which President Obama made his comments, China's state run Xinhua news agency retorted with an article which called on the United States to stop its "groundless accusations" of cyber attacks, adding that "cybersecurity should be an area of cooperation rather than a source of frictions" [sic]. However within days the rhetoric soften slightly with China claiming to have reached an "important consensus on cybersecurity" [Xinhua / Register]. Another bone that the US won't let go is China's perceived military expansion in the South China Sea and its increased military spend. The building of islands has been the subject of particular concern for more than a year [NYT]. Meanwhile military exercises, some of which have come close to American shores have raised eyebrows in Washington [CNN]. In early September Chinese navy ships entered US territorial waters off of Alaska coming within 20 km from the coastline. But while US officials stressed the Chinese ships were doing operations "consistent with international law" there will surely have been some worries in Washington. US officials said that under the maritime rule of "innocent passage," ships are permitted to enter territorial waters and are not challenged so long as they keep moving directly and expeditiously. Nonetheless, there has been a growing number of Chinese military exercises, some of which have been held with Russia, a country with which China Xi Jinping has helped to bring closer to China [Telegraph]. In May this year Russia and China launched joint naval exercises in the Mediterranean for the first time, in the latest sign of strengthening ties between the two countries [The Diplomat / Telegraph]. The continued cyberattacks, military exercises, and growing military might seem to contradict Xi Jinping's overt claim that China will never seek hegemony. Indeed Xinhua even declared Xi Jinping a 'peacemaker' [Breitbart / Xinhua]. During the commemorations marking the "70th anniversary of the victory of the Chinese People's War of Resistance Against Japanese Aggression and the World Anti-Fascist War", Xi Jinping gave a 20 minute address in which he said China was committed to peace. "In the interest of peace, China will remain committed to peaceful development," he said. "We Chinese love peace. No matter how much stronger it may become, China will never seek hegemony or expansion." [BBC / BBC blog / CNN / Guardian / NYT / DNA India / Xinhua / CCTV - YouTube]. This was not quite how many in the west saw it. Indeed the Guardian referred to the parade as being more about power than peace. Such issues have been swept away as Xi heads towards American shores. The focus for the Chinese president is foreign trade. And as he flies West he takes with him the CEOs of 15 of his country's biggest companies, representing a combined market cap of nearly $1 trillion. At least as far as Xi is concerned, this visit is about boosting China's slowing economy rather than patching up political differences [Australian / Washington Times / WSJ]. Amongst those following Xi's entourage will be Jack Ma, CEO of Alibaba, Ma Huateng, CEO of Tencent, Lenevo's CEO Yan Yuanqing and Li Yan Hong, CEO of China's biggest search engine Baidu in an effort perhaps to seek out new deals in the tech industry despite a turbulent history with the likes of Huawei and Google [WSJ]. These top executives represent the cream of China's technological prowess and shows how far China has come in less than a two decades. Xi also takes his top financial representatives too including Bank of China chairman Tian Guoli, and Jiang Jianqing, Chairman of the Industrial and Commercial Bank of China. Business and industry is also strongly represented with Wanxiang Group chairman Lu Guanqiu, Pan Gang, Inner Mongolia Yili Industrial CEO, Wang Yusio, ENN Energy Chairman, Liang Haishan, Haier Group President, Ma Zehua, China COSCO Chairman, Guan Qing, China State Construction Engineering Corp President, Wan Long, CEO of the WH Group, Li Qiang, CEO of the Tianjin Pipe Corporation, and Wang Jinshu, Yuhuang Chemical Group Chairman joining him on his week long excursion. Combined these companies have a total market value of some $987.3 billion, an indication of how important Xi sees his first state visit to the United States. "I place great importance on this visit and am looking … forward to a profound exchange of views with president Obama," Xi said last week [Guardian]. Xi is expected to give a policy speech at a gathering attended by dignitaries including the former Secretary of State Henry Kissinger when he arrives in Seattle's Westin Hotel in the downtown area of the city. And he is set to attend a roundtable hosted by the Paulson Institute, comprised of 15 US CEOs and 15 Chinese CEOs. Later he will reportedly visit Boeing's headquarters and tour its Everett factory which is likely to be involved in supplying China with a number of 737 aircraft [Seattle Times]. Of course the highlight of the trip will be Xi's visit to Washington where Obama will host the Chinese president at the White House [Shanghaiist]. Xi and wife, Peng Liyuan, will be attending dinner at the White House, though he is likely to be served more than just a Big Mac, a suggestion put forward by prospective Republican candidate Donald Trump last month [CNN / Washington Post]. While the US prepares to butter up Xi Jinping, Britain's Chancellor of the Exchequer George Osborne was already in Beijing finalising details for Chinese investment for a new nuclear power station, the first to be built in the UK for 20 years [BBC]. The £2 billion deal marks the first investment of a China designed nuclear reactor to be built in the West [FT]. Announcing the move during a five-day visit to China, the George Osborne said the proposed plant was "essential" to ensure the lights stay on as ageing nuclear and coal plants are retired over the coming 10 years. Osborne said the deal provided China with a "great investment opportunity" and represented just one of many projects that Britain was helping to negotiate between the two countries. It is not just business deals that Britain seeks to broker. Britain also aims to share its culture. As George Osborne strolled the Beijing streets the British play War Horse - which tells the story of a horse, Joey, purchased by the army for service in World War One - was being played out in the city's National Theatre [China.org / BBC]. Meanwhile Neil MacGregor, director at the British museum, spoke of the importance of a new exhibition which aimed to celebrate the two countries' interconnected cultures [Telegraph]. 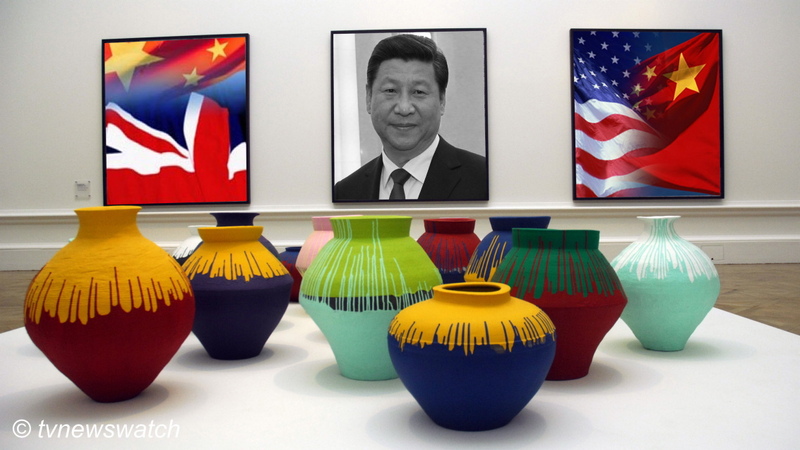 This last week saw one of China's most important artists opening an exhibition at the Royal Academy in London. It drew a huge amount of interest and publicity, given the history surrounding the artist himself who has become known as much for his activism and his calls for human rights as he has for his art [Guardian / Telegraph]. That is not to say his art is not political. Nearly every piece on display at the Royal Academy is a statement on the more controversial side of China. Amongst the exhibits is a sculpture of a surveillance camera made from marble mined from the same quarry as that which served to build Mao's mausoleum in Beijing. Then there is the less subtle depictions of Ai Weiwei's own incarceration following his detention by authorities in a piece he calls S.A.C.R.E.D - (i) Supper, (ii) Accusers, (iii) Cleansing, (iv) Ritual, (v) Entropy, and (vi) Doubt. Other pieces focus on the tragedy of the 2008 Sichuan Earthquake with one installation called Straight, comprising hundreds of reinforcing bars, taking up almost the entire space in one room [BBC]. Either side is a sobering reminder of the lives lost with the names of the many hundreds of children listed on large plaques. Ai Weiwei points fun at the less than harmonious society he believes China to be. His installation He Xie, a collection of several hundred porcelain crabs, is a reference to an Internet meme. The former Chinese president Hu Jintao often referred to the importance of building of a harmonious society in many of his speeches. For example during a speech at the Fortune Global Forum in Beijing on Monday 16th May 2005, Hu said, "We must focus on economic development as our central task, making development our top priority and facilitating and all-round progress in economic, political and cultural aspects and in the building of a harmonious society" [CNN]. But given many people in China saw his vision of a harmonious society as being somewhat incongruous with the suppression of dissent and the tight control on information in China, the homonym Hé Xiè [河蟹], or River Crab, was born, a word which has a similar pronunciation to Hé Xié [和谐] or Harmony. The term has since become a symbol representative of state censorship in China. As well as making comment on Chinese politics, Ai felt it necessary to make a statement on a number of issues affecting Europe. Soon after arriving in London Ai Weiwei joined a fellow artist, Anish Kapoor, on a walk through London to highlight the plight of refugees fleeing places like Syria [Guardian]. He also made a special trip to the Ecuadorian Embassy in order to pose for a selfie with Wikileaks founder Julian Assange [TIME / Washington Post]. Ai Weiwei has not sought asylum in Britain, nor is he a refugee. But he nearly did not make it to the UK, or even out of China for his retrospective exhibition. Indeed there appeared to be some embarrassment about granting the artist a visa to visit the UK. Authorities gave the artist only 30 days, rather than the six months he had applied for, saying he had lied about his convictions, though such convictions are a matter of debate since many regard them as illegal detentions rather an actual convictions [BBC]. Indeed there has been much speculation that the denial was more to do with another upcoming visit to Britain of someone considered more important that Ai Weiwei. Following his visit to Washington, the Chinese President Xi Jinping will stop off in London on his first visit to the British capital. At the end of the day both the US and Britain needs China's money, while China needs trade. While issues concerning human rights have been raised, China is seen as "too economically important," so says Shaun Breslin, a China analyst, speaking to Sky News said in the wake of the announcement of the nuclear deal. Having Ai Weiwei's exhibition in London is perhaps embarrassing enough given the timing of Xi Jinping's visit. But to have China's "most dangerous man" - as some have described Ai Weiwei - in his midst at the same time would be a little too hot to handle. Both the US and UK have both sought a pragmatic approach to China. Gone are the days of Ping Pong politics of the 1970s [BBC]. China is now a serious player in the international game of trade, business, finance and politics. And in today's new world order the rules have changed [NYT].